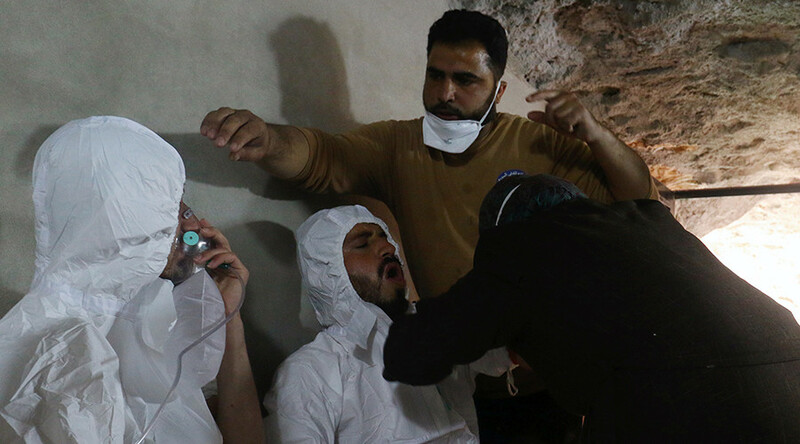 Over the last week the US ordered ‘sweeping’ new sanctions on Syria following the still as of yet unsubstantiated sarin chemical attack out of Idlib. While the political fallout after the highly questionable WMD allegations continues, there are details concerning NATO weaponry making their way into the hands of terrorists in Syria, as ISIS reportedly ‘apologized‘ to Israel for opening fire on IDF soldiers in Golan Heights on at least one occasion. This past week, the US Treasury’s Steve Mnuchin, a former Goldman Sachs partner and ex-Soros Fund Management employee announced sweeping new sanctions set to take effect on Syria following allegations over a chemical weapons attack said to have taken place in early April in the province of Idlib. “A senior administration official said the 271 people cited included chemists and other scientists or researchers who have worked for the agency since at least 2012. The Times adds that in January, the Trump administration enacted sanctions on “18 senior Syrian government officials and five branches of the Syrian military,” over allegations concerning three separate chlorine gas attacks throughout 2014 and 2015. In 2014, the Syria handed over 1,300 tonnes of chemical arms to the UN and Organisation for the Prohibition and Chemical Weapons (OPCW) to be destroyed and has denied using sarin or any chemical weapons during the ongoing Syrian conflict. QUESTION: Is there something deeper behind the military escalation of the US in Syria? “According to the Stockholm International Peace Research Institute (SIPRI), arms imports to Middle Eastern countries have had an 86 percent upsurge over the past decade. In addition, US arms exports have amounted to nearly one third of global arms imports from 2012-16. Here at 21WIRE, we’ve also noted the political fallout concerning the latest WMD allegations out of Syria, as the heavily propagandized imagery brought to us by the US-UK and Gulf state backed White Helmets group has been parroted by Western media without question. The White Helmets of course are well documented at 21WIRE, a group that has a history of producing western-oriented war propaganda. All of this has occurred as Western media has gone mostly silent about the recently distressed Idlib villages of Kafarya and Foua which endured great suffering at the hands of Gulf-state backed terrorists, as recently reported by 21WIRE‘s Vanessa Beeley. Is this what we are witnessing now? At midnight on 14 April, several buses with civilians on board left the terrorist besieged Kafarya and Foua areas of northern Syria, as part of the so-called “four towns deal.” A journey which should have taken forty five minutes, took more than seven hours as terrorist groups forced buses to stop at several villages held by them along the way. At each of these stops, armed men taunted and threatened them. By the time they reached al-Nusra held compound at Rashidin, the final stop before entering Aleppo, they were already traumatised. But their trauma was just beginning as they were held captive on the buses for a further day and a half; denied food and water. On the morning of the 15th, terrorists turned up with big transparent bags containing packets of crisps. Allowed off the buses, the children swarmed around the men with the crisps, not having seen food like this for over two years. Ten minutes later, the children were forced back onto the buses. At around 3pm on the 15th, more crisps were delivered for the children, who once again were allowed off the buses, this time with some of the younger men. Again, the children, full of excitement, swarmed around the man with the crisps. At that moment, having been deliberately enticed off the buses with the promise of food, a bomb exploded, killing 126 people, at least 80 of whom were children. Next, the women – only the women – were allowed off the buses. Already traumatised, and now in a state of sheer terror and panic, they frantically searched for their children. As if by magic, the White Helmets appeared with their entourage of videographers to record them “saving” the distraught mothers. After ten minutes, the women were forced back onto the buses and the doors were locked. Contrary to media reports, these “first responders” did not help to look after the injured, and they did not help return the dead to their families. Instead they took their video propaganda and around two hundred injured children off to Turkey. Many of these children have still not been returned. 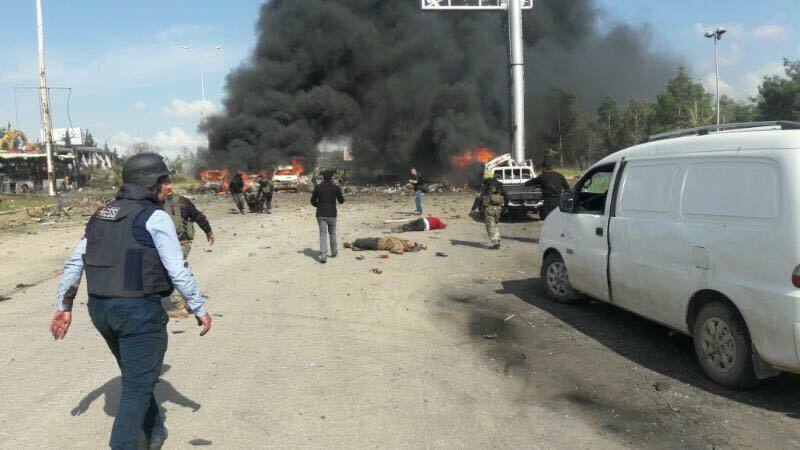 The Rashidin bus bombing represents a new low in the tragedy that is Syria. Based on witness testimony we can say with certainty that it was a planned event, with innocent civilians used as pawns in a propaganda game aimed at giving continuing credibility to the White Helmets in the eyes of all those fooled by the lies published in western mainstream media. So where does Rashidin leave the claims of western governments that Bashar al-Assad gassed his own people in Idlib province just over a week prior? Reports describing that “attack” came solely from the White Helmets – the same White Helmets that were willing to use the murder of dozens of children at Rashidin for their own purposes. It is difficult to believe that any group willing to entice children off a bus in order to blow them up would have any compunction about killing others with some kind of gas, photographing rows of their dead bodies for propaganda purposes before shipping them to Turkey for autopsy. That propaganda has been well used. Following the defeat of a UK sponsored draft resolution submitted to the UN Security Council at the beginning of March, the White Helmets’ reports claiming Assad had gassed his own people could not have come at a better time. Britain’s permanent representative to the UN Security Council, Matthew Rycroft, began the verbal attacks on Syria and Russia. Boris Johnson followed up with his own unsubstantiated claims. At no point was any evidence placed in the public domain, and at no point did any mainstream journalist do their jobs to ask why. US President Trump fell for the scam, to the delight of Downing Street. He ordered a missile strike on an airbase at Shayrat, near Homs. Again, no evidence was provided to support these accusations, either by Rycroft, or subsequently by Boris Johnson. Both fell back on a default position of “the Organisation for the Prevention of Chemical Weapons” said so. And they did, despite not having ever attended site. The OPCW’s assessment was based on the testimony of the White Helmets, and some autopsy results. They have not, to date, visited the site of the alleged bombing to gather any real evidence.